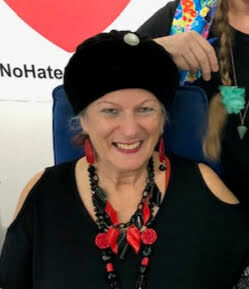 Jilliana is a radio journalist and interviewer on Brighton and Hove Community Radio (BHCR) on the Friday at noon programme ‘Your voice matters.’ In her role as co-presenter with the owner and founder, Susi Oddball. Vlogger and interviewer, Jilliana has her own YouTube channel (Please subscribe) under Jilliana Ranicar-Breese. Alternatively Google Jilliana Ranicar-Breese or Jilliana in Brighton. Jilliana is also a life writing facilitator. In 2017 Jilliana won the best co-producer BHCR award. In 2018 Jilliana won The Rotary Club of Brighton for Community Service Recognition Award. Jilliana RB is a senior reviewer for TripAdvisor (level 6). Jilliana’s vignettes are on Swan Morrison’s humorous website. Her interests are varied. Poetry, humour, quotations, photography [faces and places], gardens and architectural plants, slow travelling, world music, world food, languages (French, Italian, Spanish, Brazilian Portuguese, basic Greek, basic Turkish and basic German), History, 1492 and diaspora, Ottoman Empire, fashion especially hats and costume jewellery, modern and vintage, cats and a world full of colour!